I have been, for as long as I can remember, quite disposed towards tales and anecdotes. Like little pieces of pearl wound in a loose necklace, history tries to bring together a string of events and in the austere attempt, dips and rises on so many occasions. What otherwise would have been a prosaic day back in the 11th century, today holds so much relevance for the Bangalore city. Wondering why? The apocryphal tale below holds your answer. So one fine day, King Veera Ballala II decided to go hunting and while on his expedition, seemingly lost his way in the forest. Starving and exhausted, he came across an old woman who generously offered him boiled lady’s fingers to satiate his hunger. Pleased, the King christened the place as ‘benda kaal-ooru’, which literally translates to town of boiled beans. Later, this has been colloquialised to Bengaluru. Fascinating, right? What I am trying to say is; Bangalore has had an affluent history. Heroes, forts, leaders and now Silicon Valley, Bangalore has absorbed so miraculously all the vagaries and it is no surprise that it is, as of today, the most sought after real estate location for investors and buyers. The rich historical relevance goes a long way in lending an almost royalty-like leverage which is not offered to the other cities of similar origins. Do you remember that first bencher from your 12th class, rimmed spectacles with an air of arrogance from knowing too much or as Professor Snape from Harry Potter would call them ‘the insufferable know-it-all’? That one kid who, regardless of sun, rain or storm, just had to outdo everyone and get the best score in the toughest subject? If Real Estate was a subject and Bangalore was a student, it would be precisely that first bencher from your 12th grade. Because the reports just showed that in the first quarter of 2018, Bangalore has outperformed all its neighboring locations and has absolutely aced the realty world! Why Bangalore has performed so well is actually, on a foundational level, an outcome of the impetus received after the 1991 Economic Reforms. In the 1990’s, the influx of capital investors into the city was largely followed by conversion of large Bangalorian plots and bungalows into multi-storied apartments. This move spurred into action a chain of related activities. With the pouring in of information technology companies, by the 20th century, Bangalore had deftly garnered reverence for itself in the realty world. Without a doubt, Bangalore has bagged the preening rights for atleast a while. According to a research report, Bangalore has even surpassed the demand and supply in housing of Chennai and Hyderabad. To quote a few figures for further emphasis, housing sales in Bangalore stood at 11,500 units from January to March 2018 whereas the numbers were just 3,800 units in Hyderabad and 2,300 units in Chennai. Even when we compares the newly launched projects, Bangalore produced about 4,200 more projects than Hyderabad and 4,500 more projects than Chennai. Concorde Mayfair is an upcoming property in Medahalli, Bangalore. Check it now !! Anarock Property Consultants also commented that even on a pan-India level, Bangalore occupies second place just after the Mumbai Metropolitan Region. People have been coming up with a greater urge than ever to upgrade their lifestyle. We need better cars, better food, better clothes, better entertainment and primarily, better homes. Bangalore encompasses all the provisions needed for that lifestyle and therefore, quite naturally, is becoming a favorite location in real estate. Moreover, Bangalore offers the entire spectrum of housing from uber luxurious and posh complexes and duplexes to extremely affordable housing. It becomes quite important to highlight that the increasing job opportunities in the region is another extremely important playing factor for the upswing in the demand. The IT hub in itself is self-sufficient in employing everyone. With companies like Wipro, HCL, Infosys, Oracle et cetera, Bangalore becomes extremely lucrative career wise. Apart from this, there are banking institutions, healthcare career opportunities and teaching opportunities that can be availed in Bangalore. 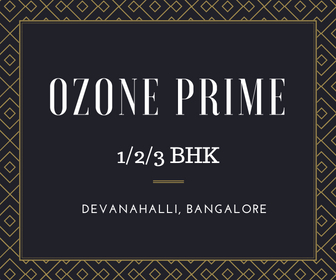 Ozone Prime is an upcoming residential Apartments in Devanahalli, Bangalore. A few more deeply seated reasons for the amazing performance by Bangalore is potentially also one of its biggest strengths: stability and professionalism. The real estate market in Bangalore has successfully withstood the test of time and legal changes and has the most consistently well-performing real estate market in India. Naturally for investors it stands on the top of list potential investments. Additionally, the groups of builders operating in this region have maintained the quality and the promise of delivering premium houses, time and again. Such trust undeniably works in the favour of Bangalore in this competitive real estate market. Recently, the metro and road connectivity has also witnessed massive improvements. Existing metro stations are being extended in order to provide proximity to homes and offices and cut down on the hassle of morbid day-to-day time consuming conveyance from one place to another. So many good schools and hospitals have also sprouted in the area making it extremely convenient for the people to access them with least discomfort. Even the shopping complexes and mall play a vital role in swaying the people’s choice and Bangalore, needless to say, does extremely well in that department. The culture reeks of modernity, lavishness, zeal and a spirit of entrepreneurship not just commercially but even otherwise. The elusive maritime weather makes for a perfectly subtle underlying tone against the starlight of the city. The diversity and modesty of the populace in general is charming and all this minutiae add up to make Bangalore what it is. In totality, it has all the optimal conditions of becoming the hub of real estate investment and it won’t come as a surprise if it overtakes even Mumbai in the coming years. 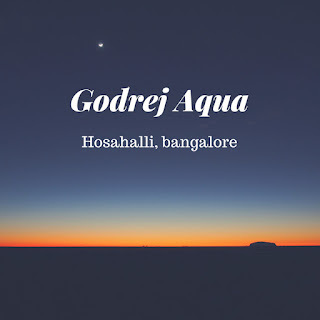 The Godrej group is coming up with an exciting new residential project called Godrej Aqua in the area of Hosahalli, Bangalore, Karnataka. It is still in its initial phases but will be spread across many acres having world class amenities. There will be 1, 2 and 3HK housing options. Each will have well ventilated and spacious bedrooms coupled with several other states of the art facilities to add up comfort in your living. Coming to the project it will be composed of individual housing units which will vary in size. You can buy any unit depending upon your budget and living requirements. Since it comes from the house of Godrej its carries the medal of trust in real estate which also makes it a fruitful investment. The project is a perfect combination of luxury and comfort and boasts of innovative and creative designs. Which are the Nearby Prime Locations Around Sobha Dream Valley? When you decide to buy a property in a particular location, explore the neighbouring localities too before you invest in. 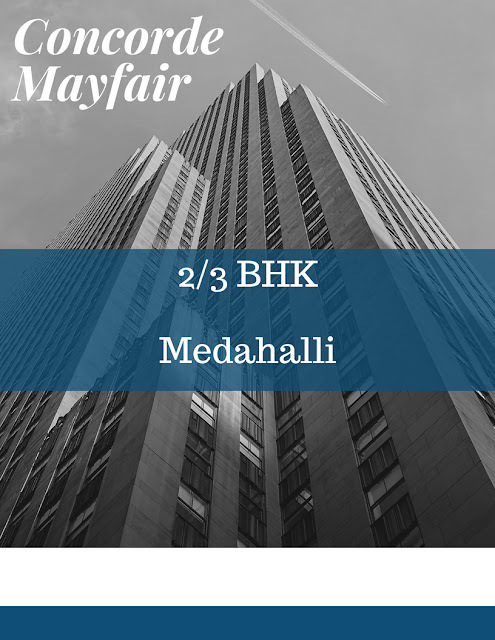 A developed locality attract the buyers naturally and is an ideal place to live in with excellent infrastructure, decent neighbours, ample facilities and with essential civic amenities. Sobha Dream Valley is one such prime project developed by Sobha developers in the rapidly developing prime locations of off Thanisandra Main Road, on Kannuru Road, Bellahalli, Bangalore. 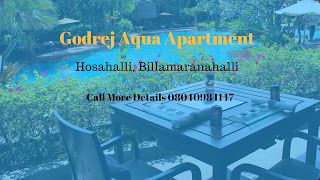 Godrej Aqua, the residential homes located in Hosahalii, Billamaranahali, Bangalore. It is developed by Godrej Properties. The Godrej Aqua amenities are such that the residents will never feel any discomfort. Rather the comforts are beyond thoughts. Those who will choose to live in this place will never feel isolated as there many places to visit nearby and engage yourselves. The significant Godrej Aqua location ensures it.